Trump to deliver his predetermined solution to school shootings. It is a solution right out of the playbook of the National Rifle Association  payback for the $30 million the NRA spent on Trump's campaign. The solution? More guns. We should arm the teachers. "We have to harden our schools, not soften them up. A gun-free zone to a killer …that's like going in for the ice cream, that's like here I am, take me. But I think we need hardened sites. We need to let people know, you come into our schools, you're gonna be dead". "We drop our kids off at schools that are so-called gun-free zones that are wide open targets for any crazy madman bent on evil. They all must come together to implement the very best strategy to harden their schools including effective, trained armed security". As LaPierre has rather famously stated, "The only thing that stops a bad guy with a gun is a good guy with a gun". Trump believes he would be that guy. "You know I really believe, you don't know until you're tested, but I think I, I really believe I'd run in to.., even if I didn't have a weapon." Trump was the first sitting U.S. president since Reagan to go to the NRA's annual convention last April where he told them, "You came through for me and I am going to come through for you". Apart from the ugly picture of fortified schools and educators carrying guns on their hip; apart from what that tells our youth about how miserably our society has failed by its obsessive insistence that virtually anyone should be allowed to own a gun; apart from that, how would Trump's ill-considered gift to the NRA work out? "If the coach had a firearm in his locker when he ran at this guy,… he wouldn't have had to run. He would have shot, and that would have been the end of it." So the coach, with only a handgun, but expertly aimed as it would have to be, would have taken down the kid who was wearing body armor and a reinforced helmet and spraying bullets from his semi-automatic AR-15 assault rifle. The coach would have to be lucky enough to come from behind the shooter unseen, or when the shooter was changing magazines. Those are the stiff odds we will be asking our teachers and coaches to face under the Trump plan. Or are they, too, to have AR-15s in their lockers? A teacher would also hope to be alone with the shooter in a classroom or hallway so that when he or she  76% of teacher are women  fires his or her handgun, there is no turmoil of students and other teachers running from the shooter that could be hit. But we're forgetting that Trump said, "it only works where you have people very adept at using firearms, of which you have many". He imagines that schools are filled with ex-military. But at least that admits that not just any teacher could handle the job of being the secret campus cop with the concealed-carry handgun ready to go against the assault weapon. They would need training. Assume that the volunteer teacher gets the same training as the local police officer. That's not much. The fact is that most bullets fired by police miss their target. (It took over 100 rounds fired by police to kill Dzhokhar Tsarnaev in the Watertown, Mass., shootout after the Boston Marathon bombing.) So where would the teachers go not to just learn how to hit a stationary paper target at a firing range, but the kind of special ops training needed to confront with only a handgun someone on the move firing an AR-15, if such training exists? And all of this assumes that the teachers in our schools  men and women alike  have the kind of cool resolve that will filter out the chaos of a gun battle and overcome the fear of death, carefully aim a gun, and squeeze off a round or two. Are the teachers and coaches to contribute the time and personal travel expense of the training? "What I'd recommend doing is the people who do carry, we give them a bonus. We give them a little bit of a bonus", says Trump. That should make them step up. But who is "we"? Who pays for the specialized training and the little bit of a bonus? Not Donald Trump and the Republicans in Congress. The president's own budget cuts money for school security. His bold plan leaves all the costs to the local school districts. Nor will the federal government pay a penny for the wrongful death suits when a coach's or a teacher's stray bullet kills a student or another teacher. Will those coaches and teachers volunteer when they realize that they will need insurance to cover the liability risk? Will insurers even write such policies? Just take note of the millions of dollars a year that local governments pay out for bad shoots by trained police officers. 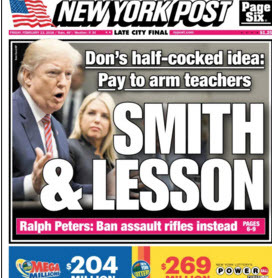 “So let’s say you had 20% of your teaching force, because that’s pretty much the number”, was Trump's proposal for how many teachers should be armed in his concealed carry plan. There are 3.6 million teachers in the U.S., so his 20% means that 720,000 teachers in America would go to school every day wearing guns. Suicidal crazies with AR-15s bent on Armageddon are "not going to walk into a school if 20% of the teachers have guns", he thinks. And to demonstrate how carefully he has thought out his plan he added, "or 10%, or maybe 40%". But now you see why the NRA is delirious about armed schools  three-quarters of a million gun sales served up to their clients, the gun manufacturers that support the association. That's more than seven guns on average for each of the country's 98,000 schools. At Parkland's Marjory Stoneman Douglas  a big high school  28 coaches and teachers would have been carrying guns that day to meet the 20% quota. Amid the gunfire and rush of running students and teachers in the hallways, each would have the added risk of misidentifying and shooting each other. And then the SWAT team arrives. How many of the 28 gun-toting teachers and coaches  or the 8 in the average school  would they mistake for the shooter? In a CNN town hall shortly after the shooting, Florida Republican Senator Marco Rubio, who has taken $3,600,000 in backing from the NRA, was fending off suggested restrictions on assault rifles: "It's not the loopholes, it's the problem that, once you start looking at how easy it is to get around [them], you would literally have to ban every semi-automatic rifle…". That unintended slip was interrupted by sustained, screaming applause. It showed what the public truly wants. Jake makes valid point – BOTH Sides have good Talking Points, but the reality demonstrated lately of the THINKING Skills of John Q. Public has only supported the fact that they p” Parrot ” what they hear, and have no actual Special Knowledge of the Question. I also see The POTUS Point, where if a ” Shooter ” knows that they will encounter Armed Resistance, the likelihood the Shooter will reconsider their Act as a Loose – Loose situation; and retreat from the idea & act. As to The Federal Government being responsible for a State Duty to its Citizens, NO ! It is The States Responsibility to Safe Guard its Citizens and Communities – ergo Student and School Safety anywhere within The State Jurisdiction & Territory Boundaries’ do not see Armed Teachers as in Israel, as the Solution – but Armed Uniformed Certified Security Officers who are subject to Inspection by Local Law Enforcement, either Sheriff or Police entities as the Solution with Defined Specific Jurisdictions and Points & Authorities with NO ASSUMPTIONS to be made by the individual Officers also having a Legal Defense Program as part of the Contractual Agreements ” Spelled Out ” to avoid confusion , mistakes, & assumptions. 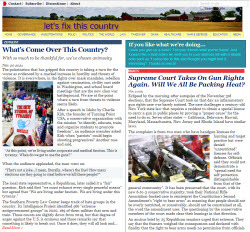 Letsfixthiscountry started off as a promising, non-partisan source of new ideas. Now it seems to be completely aligned with the viewpoint of big city Democrats. There’s nothing wrong with that point of view, but there are many other places to hear it repeated endlessly. Both sides of the gun control divide have a few valid points along with plenty of dubious ideas. Each accuses the other of being completely irrational dupes of malicious forces. Letsfixthiscountry should at least consider the possibility that both sides include rational people who would be more open to compromise if their opponents didn’t so openly despise them. Thank you for your comment but please do take note that we only discuss the president’s (and NRA’s) proposal that teachers throughout the nation be armed, which has met with widespread public disapproval. Our scenario presents how unworkable and dangerous this particular plan would be. The article does not discuss the overall gun issue. I’m trying to point out that the article gives the impression that there is a consensus that arming teachers is a ridiculous idea on its face. Your response – it has “widespread public disapproval” ignores the substantial voting block that disagrees. To be clear, I don’t think it’s a good idea either, but I know plenty of GOP voters whose bone deep distrust of Democrats and the “MSM” is reenforced whenever they read pieces like “Parkland’s Grieving Visit Trump Looking for Answers. His Solution, 720,000 More Guns”. It expresses a viewpoint that disparages anyone who sees things differently. Supporting only one side of such a fundamentally divisive issue doesn’t advance the cause of fixing our country. It saddens me to think that this site has become just another unimaginative partisan echo chamber. The web has no need for more of those. You’re right. A CBS poll supports your “substantial voting block”. It has 68% of Republicans favoring armed teachers with only 28% against. A poll of the teachers themselves would be useful to see what they think about what the public wants to foist upon them. Who has suggested arming teachers without their consent? Nothing is being “foisted”. There are willing, qualified, and able persons who teach that would provide a deterrent to a potential shooter. Will someone please explain what “valid point” there is for allowing assault rifles to be in possession of anyone other than military personal? I happen to own several guns and enjoy target shooting, hunting and have no problem with banning assault rifles. I don’t understand why anyone else does and please… no “slippery slope” comments… for all the juvenile “GI Joes” out there, just go to a range where they rent assault rifles and machine guns and get your ya ya’s out. And this forum has NOT become a “big city democrat’s forum”. I happen to be a conservative republican of 60+ years and frankly i don’t recognize the republican party as it exists today.